A scene from late 19th Century Kiev? No, today's citizens rugged up against the city's snowy winter. ONE of the oldest cities in Eastern Europe, Kiev has kept many early 20th Century landmark buildings including the bizarre Gorodetsky House. Popularly known as the House of the Chimaeras, it is a remarkable Art Nouveau building covered in surreal sculptures of winged birds, frogs and wild boars. The building derives its name from the ornate decorations depicting exotic animals and hunting scenes. It doesn't refer to the chimaera of mythology, but to an architectural style known as chimaera decoration in which animal figures are applied as decorative elements to a building. Called the Antoni Gaudi of Kiev, architect Vladislav Gorodetsky designed the building and Italian sculptor Emilio Sala created all of the animals, mythical creatures and plants that appear to colonise it’s façades. Before designing the House of the Chimaeras, Gorodetsky had already established himself as a prominent Kiev architect, constructing many city buildings, from the St. Nicholas Roman Catholic Cathedral to the Karaim Kenesa and today’s National Art Museum of Ukraine. Emilio Sala created both the internal and external sculptural decorations, including mermaids, dolphins, sinking ships and hunting trophies. Although concrete was still in its infancy, Gorodetsky used it to construct the building and insisted Sala use it to create the sculptures. The architect originally designed the building to house a large apartment for himself with the other floors to be leased as expensive flats. But Gorodetsky's finances ran out in 1913 and he was forced to sell the building. Reflecting Kiev’s troubled early 20th Century, the building was sold several times before housing military offices for the Bolsheviks, communal housing and then a polyclinic for the Communist Party. By 2003 it was in need of a complete restoration. This was finished in 2005 and the House of the Chimeras now hosts diplomatic functions for the President of the Ukraine who has offices across the street. A detail of one of the mythical winged creatures on a pillar at the front of the building. Italian Emilio Sala's sculptures of mermaids, water lilies, frogs and wild boars that writhe along the building's parapet. The imposing entrance to Kiev's Kreshchatyk Metro. Escalators take commuters deep into the vast underground halls of the city's Metro. Designed as an Eastern European palace, Kiev's Zoloti Verota Metro is decorated with elaborate tiles and wrought-iron lamps. 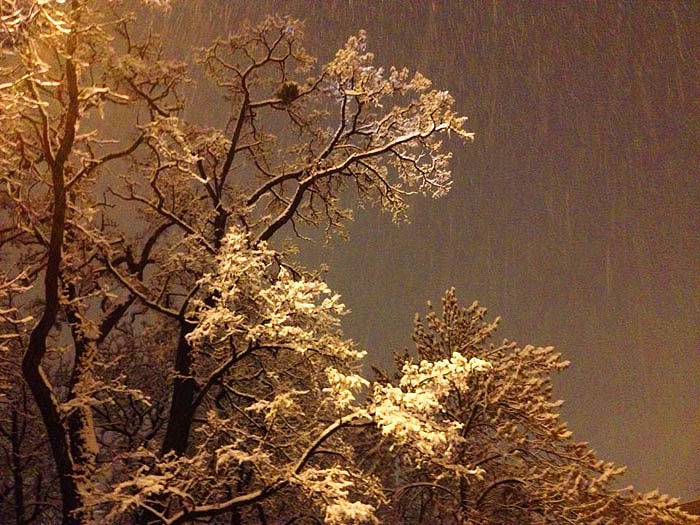 Bare, wintry trees seem frozen in the twilight of a snowy evening in Kiev. 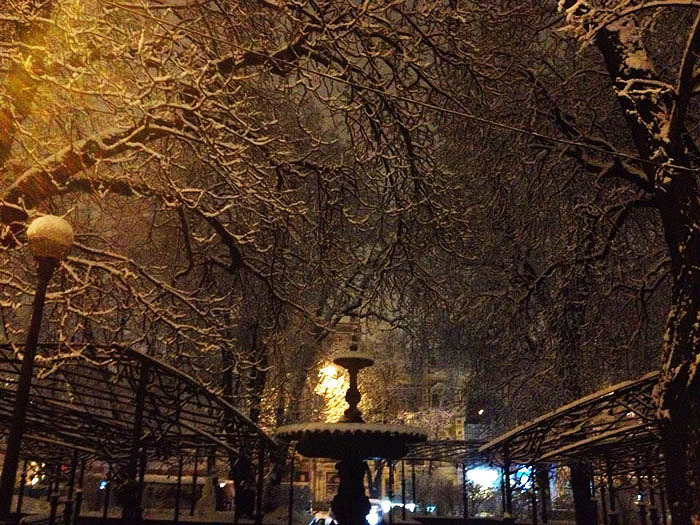 Snow falls on to the trees in Kiev's parks at the heart of the city. A dilapidated apartment building has retained it's early Bauhaus design. One of Kiev's main city thoroughfares looking grey and cold under the February snow. 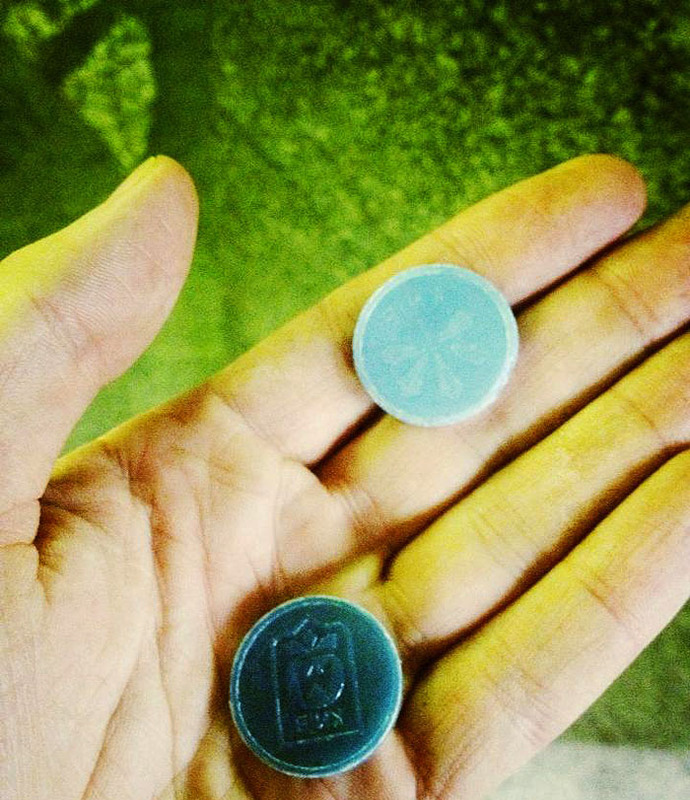 Like ancient jade coins, the Metro tokens for Kiev's trains. 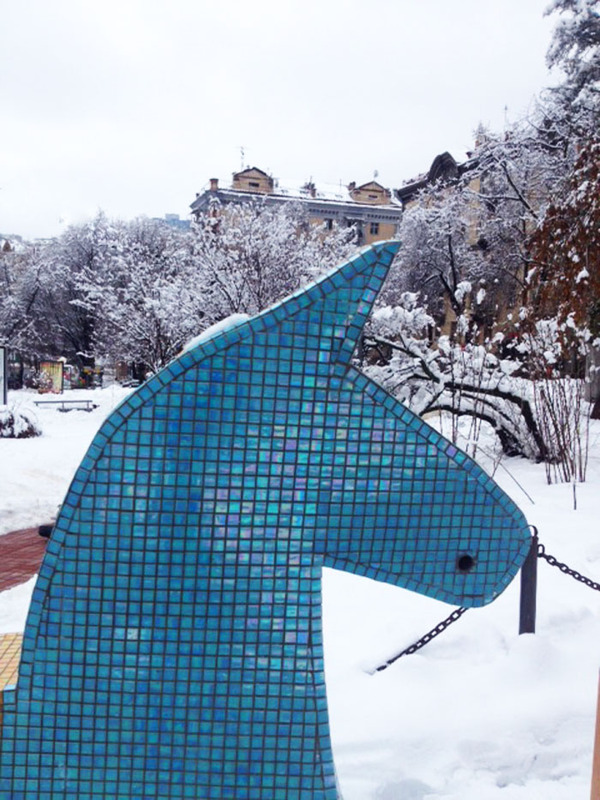 A piece of modern sculpture in lustrous Venetian mosaics brightens a snowy park. The House of the Chimaeras fell into complete disrepair after it's long history as apartments, Bolshevik offices, a Communist Party polyclinic and communal housing. It has since been completely restored between 2003-2005 and now hosts the President of the Ukraine's official functions. Sculptor Emilio Sala's creatures and curling plants cling to the building's roof and facades. A wrought iron fence is silhouetted against plants covered in a fresh downfall of snow.